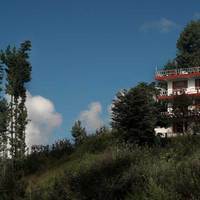 Chail & Kufri is the smallest Himalayan hill resorts. The place is situated at the height of 2250 meter from the Sutlej Valley. It is surrounded by lush green scented forest offering a beautiful and exotic view to the place. The famous Tourist Places in Chail & Kufri includes Cricket Ground built in 1893, Wildlife Sanctuary, Sai Baba Temple and so on. Kufri is a small hill station where Himalayan Nature Park is the most popular attraction. Hence if you are planning for a Travel to Chail & Kufri, we offer you the best tour packages for these places. The Chail Palace was built in the late 19th century. It once accommodated the ADCs and guests of the royal party but is now part of a charming holiday resort. The Palace has lovely walks through the dense pine forests which are the home of barking deer, wild boar, pheasant and a variety of birds. Chail has fine tennis and squash courts. Chail has also the highest cricket ground in the world - 2,250 m above the sea level. Chail Sanctuary is surrounded by deodar and oak forests and grasslands. It has abundant of sambhar, ghoral and cheer phesants, barking deer and khalij pheasant which are worth seeing.